"Secret Garden," a hit TV drama by SBS starring Hyun Bin and Ha Ji-won, is generating W600 million in tourism revenues (US$1=W1,126). On Saturday, around 400 Japanese tourists will take part in a tour program dedicated to the show. They will observe the filming of a concert scene for the show and take part as extras. 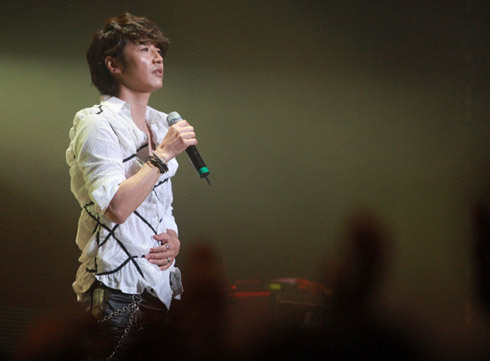 A real concert follows the filming featuring singer Baek Ji-young as well as the drama's leading cast members Hyun Bin and Yoon Sang-hyun. The three-day program also includes visits to other sets including the luxurious house that is the setting for Hyun Bin's home in the series. Yoon Sang-hyun in scene from "Secret Garden"
The price of the package differs depending on the point of departure and hotel, but averages at around 120,000 yen, or W1.6 million, per person and W650 million for 400 visitors. The producers of "Secret Garden" said unlike the tourism packages themed on other TV dramas, the tour offers fans the chance to take part in the filming. "Secret Garden" is just two episodes away from the finale this weekend.